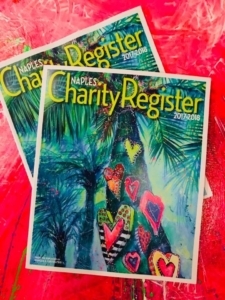 Well, the results are in and the voters chose my painting, Hearts of Palm, for the cover of the Naples Charity Register I couldn’t feel more honored. I appreciate everyone who voted to make this happen! The voting took place back in June. After a month-long call to artists that resulted in a huge number of submissions conveying the theme of philanthropy and giving, Naples Illustrated (which publishes the Naples Charity Register) narrowed the field to the three artworks that best illustrated this concept. Then it was up to their readers to pick the winner. Celebrating the good life in Southwest Florida, Naples Illustrated entertains its audience with editorial content that exemplifies the region’s luxurious yet understated elegance. Areas of coverage include trend-setting fashion, notable personalities, luxury homes, social and philanthropic events, culture and the arts, and international travel. Covering Marco Island to Captiva, the magazine is published 10 times per year and audited by the AAM (the Alliance for Audited Media). Created and produced by Palm Beach Media Group, the magazine just celebrated its 19th year of publication in January. Completing its contact with one of the wealthiest and most philanthropic readerships in the world, Palm Beach Media Group publishes annual Charity Registers in Naples and Palm Beach. 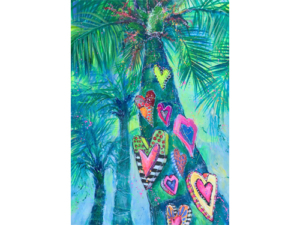 Hearts of Palm is available in limited edition prints. Call the gallery if you would like one.